I’m not feeling very proud today!! I’m sitting at my desk, planning my marriage with all the security in the world that being a British citizen gives me in 2013 and I’m appalled. Not because there is still inequality in the world, nor that life is sometimes unfair, but more importantly because I’m going to have to give up my favourite Vodka!! Now you all know I love Jack and Daniel but I’ve been cheating on them with Stolli for as long as I can remember (as a healthier alternative of course) but enough is enough. I’m not going to support an economy that not only passes blatantly anti gay laws but condones behaviour like the torturing and Outing of Gay Teens on camera. This isn’t some small nation state either – Russia makes up a huge part of the world and has the potential to negatively influence millions of lives. Now I thought I was having a bad day , and was very “woe is me” but what I saw today sickened me and put everything into perspective. It was like an anti “It gets better” campaign. and my heart went out to all those kids that have to live this way. In what way for them will it get better in the society they live in? But then I had a thought…There is one thing that we Gay people do amazingly!! 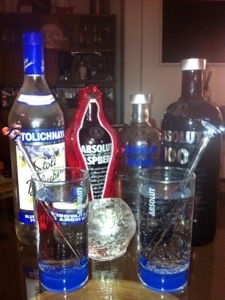 We drink!! 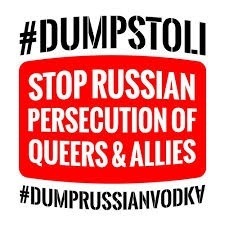 Just think if every gay bar and every gay household in the land bought Swedish or European Vodka instead, and then we encouraged all our family and friends to do the same we could bring the entire Russian vodka industry to a standstill by Wednesday!! Previous Post Its Pride Jim, but not as we know it…. Next Post Steak & chips can be healthy!!! Being Finnish, and if I drank, I’d be sipping on Finlandia. That aside, I applaud you for making the move to Absolut. Although… I hear Grey Goose is quite good! Oh hell, if its got a percentage (and not Russian) ill drink it!! And I LOVE Grey goose but out of my league price wise!! Thanks for the great feedback…seriously you will LOVE sweet potato fries!! AMAZEBALLS with steak & salad! !